RADWIMPS is likened to a fresh discovery, with lyrics showing a unique world view, a highly technical style, unmatched popularity, and a sound that cannot be constrained by genres. Having made their major debut in their 20s, the highly popular four-member group is still at the forefront of the Japanese music scene. The band has sold millions of albums, and have a reputation as one of the hardest live acts to score a ticket to among Japanese artistes. The band was formed in 2001. 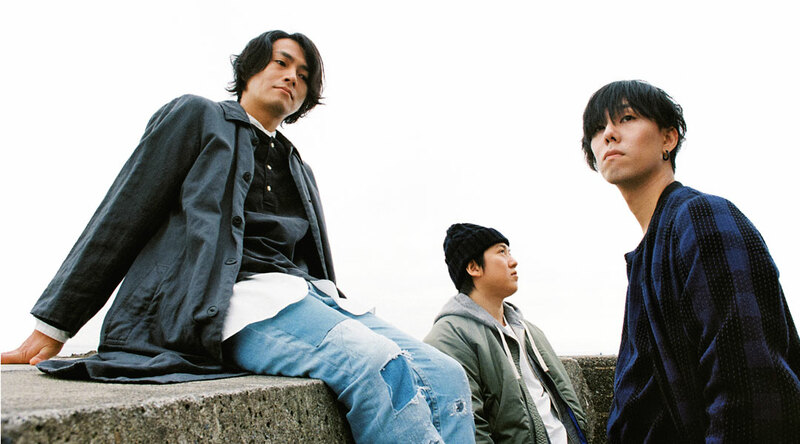 In 2003, they released their first indie album titled “RADWIMPS”. In November 2005, they made their major debut with the release of the single “25 Ko-me no Senshokutai” (25th Chromosome). In 2013, their seventh album “X to 0 to Tsumi to” (And X and O and Sin) was released. In February of the following year, they held their largest tour so far — which included four overseas concerts, for a total audience of 220,000 people. In 2015, ten years after their major debut, they made their biggest leap by going on their first European tour (with concerts in Paris, Cologne, Berlin, and London), as well as their second Asian tour (in Seoul and Taipei). Unfortunately, their drummer Satoshi Yamaguchi had to halt all his activities due to illness. Upon their return to Japan, they joined their first festival tour with eleven of their closest friends and fellow bands. At the end of the year, they held a solo live at Makuhari Messe, which drew an enthusiastic crowd of over 30,000 concert goers. In the summer for 2016, they were tasked to provide the music for the animated feature film “Your Name.”. Their unique band sound and the variety of music they composed for the film was a critical success. In November of the same year, they released a new original album “Ningen Kaika” (Human Bloom). On 25th of February 2017, they kicked off a nationwide tour at the Marine Messe Fukuoka. They are slated to play at the Nippon Budoukan on the 9th and 10th of May 2017, and will play twenty-one gigs in twelve cities as part of their “Ningen Kaika Tour 2017”. 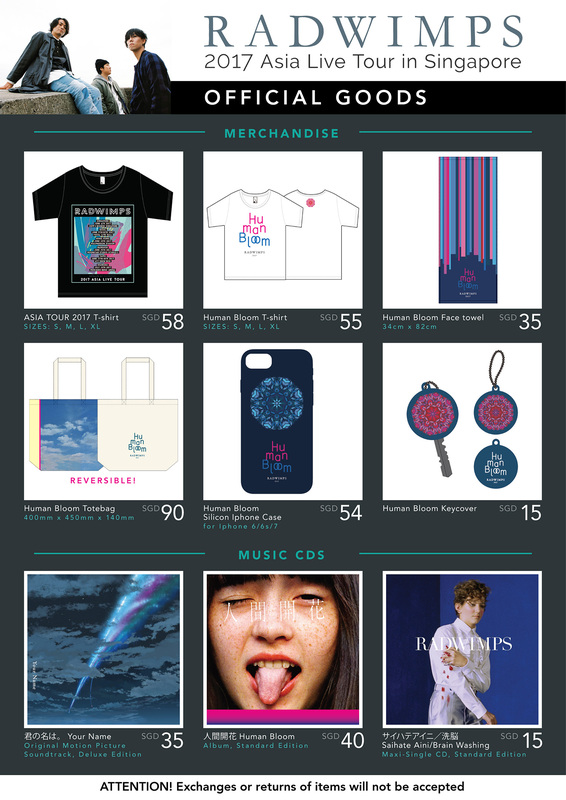 Ticket sales start Apr 3 2017, at 9am for internet sales, and 10am for hotline and physical sales. Sales will start Friday 9am online! • Standing plan is not drawn to scale. • Colour indicates price category. 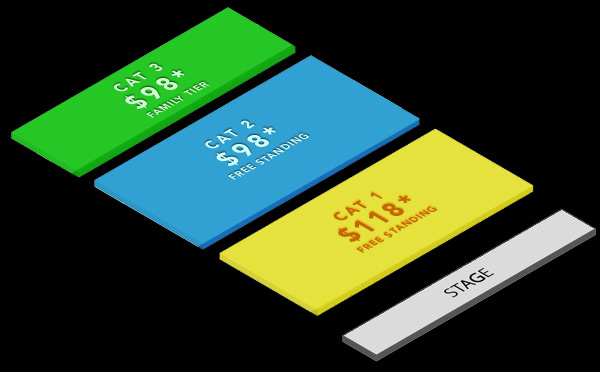 • Ticket prices excludes booking fees. • Standing layout subject to change. All young concert goers must be accompanied by an adult at all times. Each guardian or parent is responsible for his / her child/wards’s safety. We cannot guarantee that vertically-challenged individuals will be able to view the full concert. Staff members reserve the rights to remove individuals who are disrupting the concert experience for others. A minimum of 2 tickets per transaction is needed. There may be an age check at the door.